I get it, I’m totally not even close to being the only huge The Walking Dead fan out there. Zombies are the hot thing right now so EVERYONE is obsessed right? (If you need any tips on how to survive the Zombie Apocalypse, check out my post 5 Survival Tips for the Zombie Apocalypse and Other Emergency Situations.) I’m sure there are people out there who are much more obsessive than me, but I’m not concerned about them so on to the real issue — my addiction to this darned show. For me to admit that I have an addiction (to something other than coffee) was difficult. I think I went through all the proper stages, mainly denial, before coming to the conclusion that this is an issue. I’ve always been very firm in my stance that there’s not anything so important in life that I would be too upset if I had to go without it (other than family and of course the basic necessities to continue living and breathing). This includes electronics, cable, and yes, even the internet. Obviously I wouldn’t be able to blog and build relationships with all you fabulous folks without some of those things, but life would go on and it wouldn’t be that big of a deal if for some reason I just couldn’t have that stuff. Then I watched The Walking Dead. To be honest, this all started as a result of giving up one of those luxuries that I was certain I could live without, cable TV, well, satellite for me since we live in the boonies. We have done just fine without 17,456 channels of crap and really not looked back as far as that goes and the $100 a month we save on the bill has been well worth it. But there is a downside. This great money saving decision led to finding more stuff to watch that we could just stream like Netflix and Hulu. So, we were very behind the ball with picking up on the phenomenon that is The Walking Dead, because we just started watching Season 1 in like June of this year. But once we started watching I ended up not being able to stop and would watch 4 or 5 episodes EVERY evening. All of a sudden I craved it; I had to see the next episode. I stayed up late and lost sleep, not that I love to cook but I did it even less so we had a lot of macaroni and sandwiches for dinner, and housework completely fell to the wayside for the 3 weeks it took me to make it completely through the first two seasons (which is all that was available on Netflix at the time). 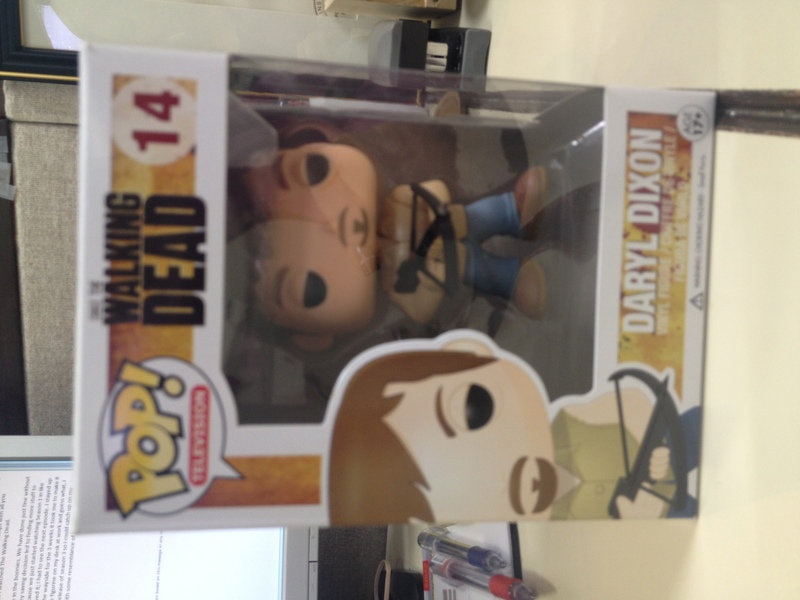 I am ashamed to admit that I now have a Daryl Dixon collectible figurine on my desk at work and guess what, I don’t even care who knows that I love Daryl! What in the world had I become – talk about zombies!! Finally there was a break between finishing up season 2 and the release of season 3 so I could catch up on my actual life and a lot of laundry. Things had been pretty sane around the house since I didn’t have access to any new episodes (and by new I mean ones I hadn’t yet seen). However, now season 3 has been released as of Sunday, September 29th on Netflix so I have 16 episodes (well 11 since I’ve watched five episodes already) to get through before life with some resemblance of normalcy can resume once again. So if my posts seem less frequent or I fall off the grid completely in the next week or two, you’ll know why – I have relapsed and fell victim to the drug that is The Walking Dead. What show do you absolutely have to watch? Do you watch like an entire season in one day if you can – a marathon if you will, or limit it to one episode a day or week? Let me know what your faves are in the comments below and maybe one of those will be my next series to check out! Thanks for Reading! I’m a HUGE fan too!!! TEAM DARYL!!!!!!!! Whew! It’s good to know I’m not the only one!